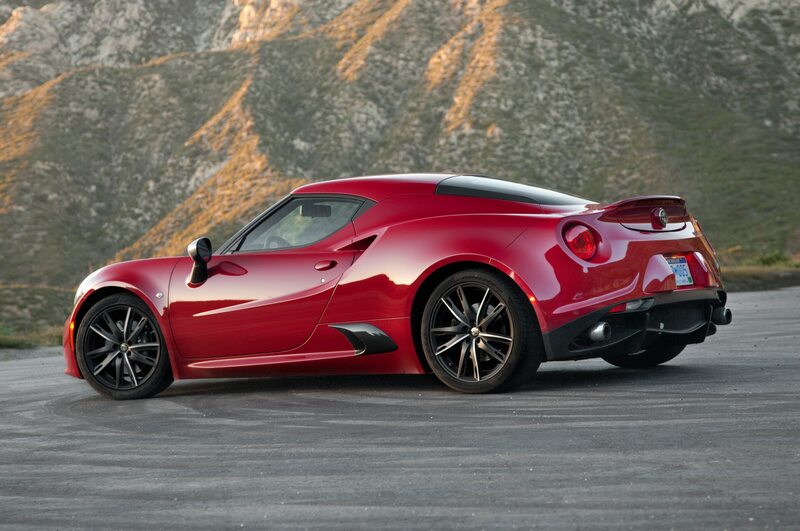 Alfa Romeo announced in 2008 it would kick off a legitimate American comeback. 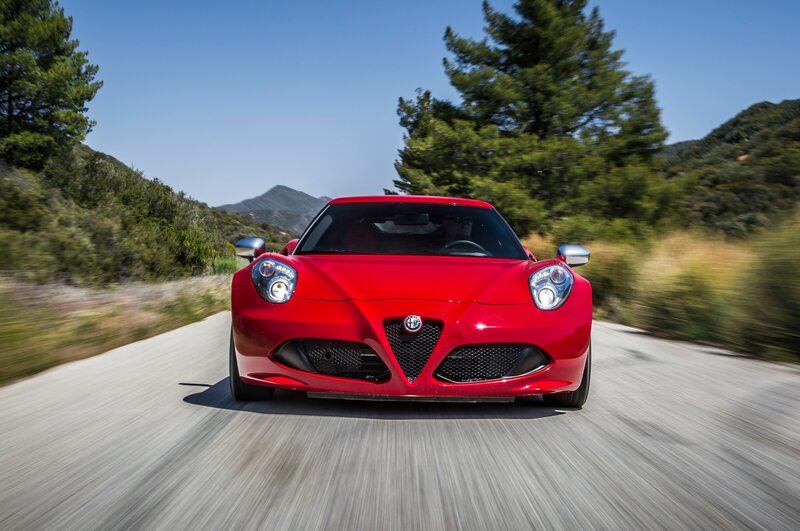 The first wide-release product here would be the 4C, a rear-wheel-drive coupe with a carbon-fiber monocoque and a transverse mid-mounted, turbo inline-four engine. 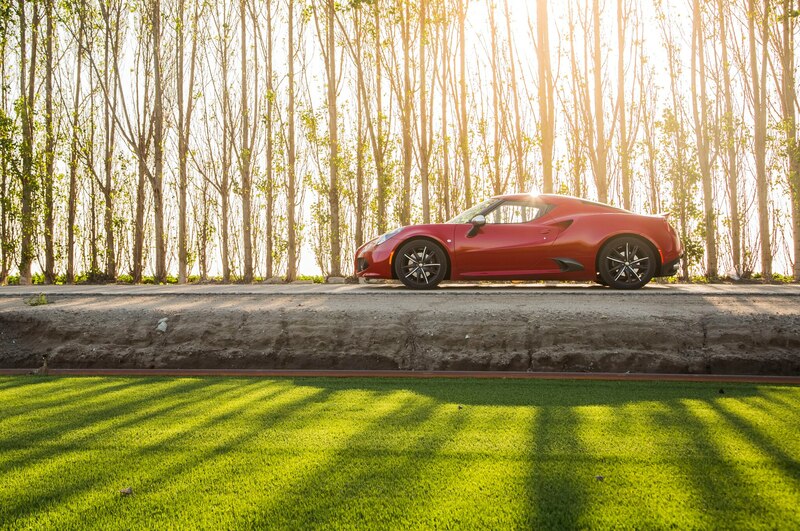 Delightful news that pushed us to the edge of our seats, where we sat and itched for half a decade as Alfa’s release hit numerous delays. 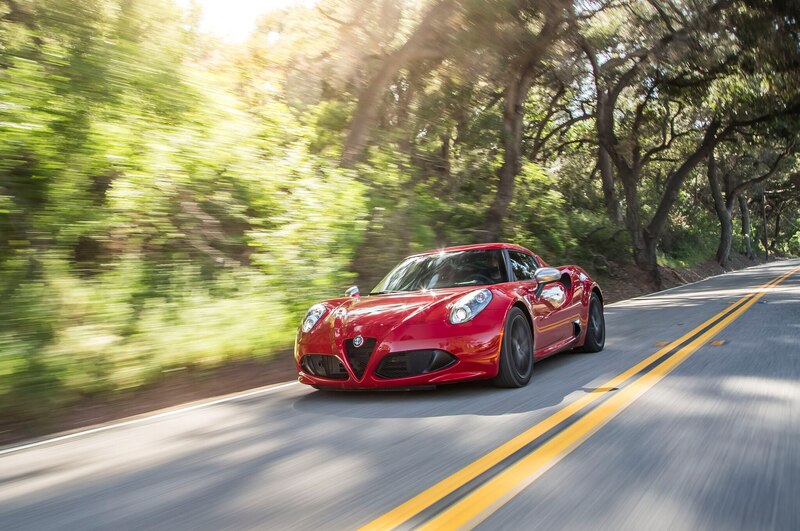 Finally, in 2013, we got our first shot at the 4C and immediately fell for it. 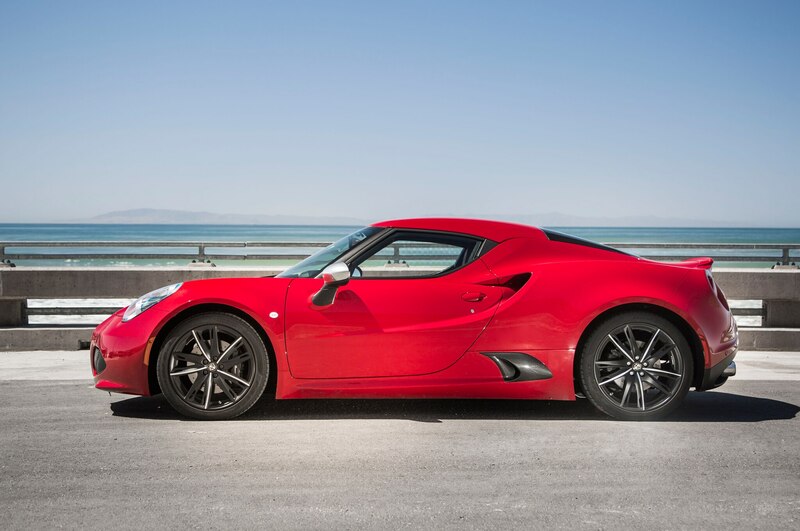 The 4C then captured one of our 2015 All-Star awards for being “an unapologetic, unfettered, unfiltered sports car.” But were we being too kind, pouring praise over the brash little car because we wanted so badly to believe we weren’t waiting in vain? 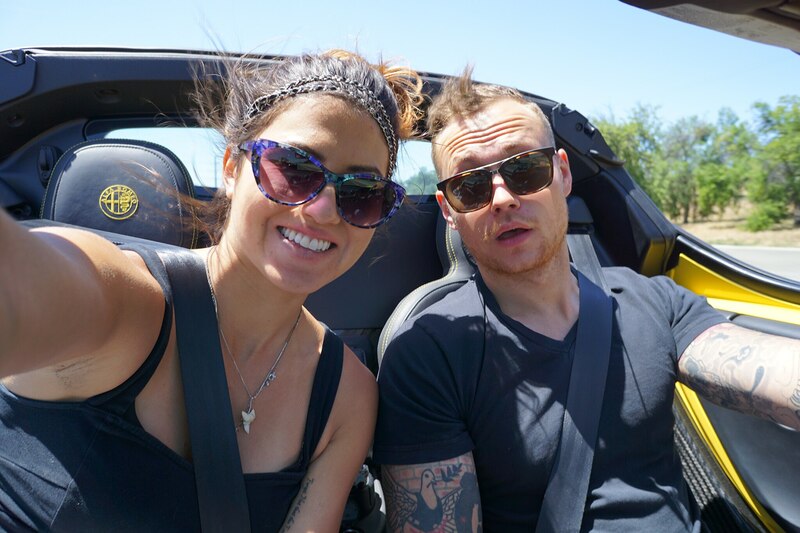 We had to be sure, and the surest way to do so was to spend a year with one. 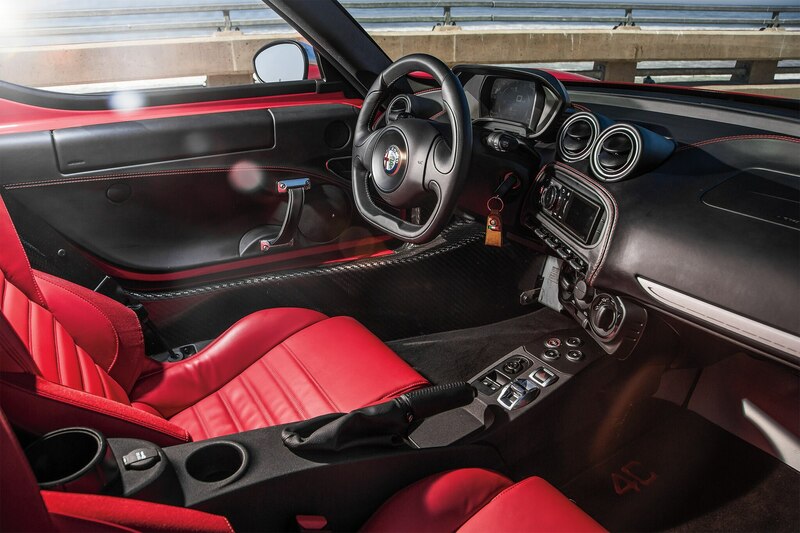 A few pessimists predicted this would be a futile test of our own masochism, but most were excited by the prospect of spending intimate time with such an evocative driver’s car. 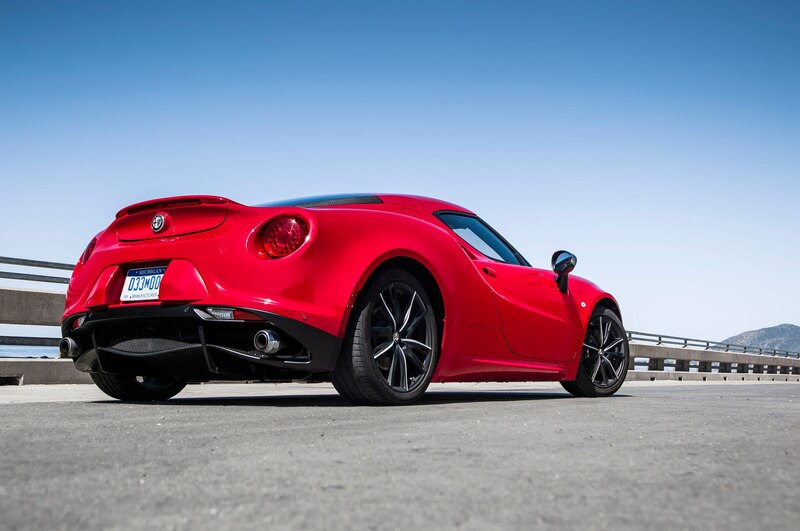 We ordered a bright red 4C coupe with the $2,750 leather package, $1,800 convenience package, $300 black brake calipers, and $700 attention-grabbing exterior paint. 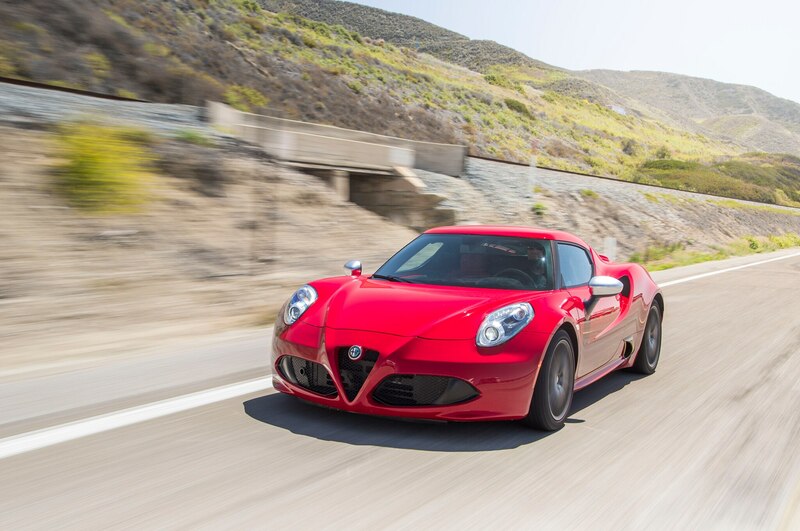 It rang in at $64,445, making it the cheapest all-new exotic on the market. 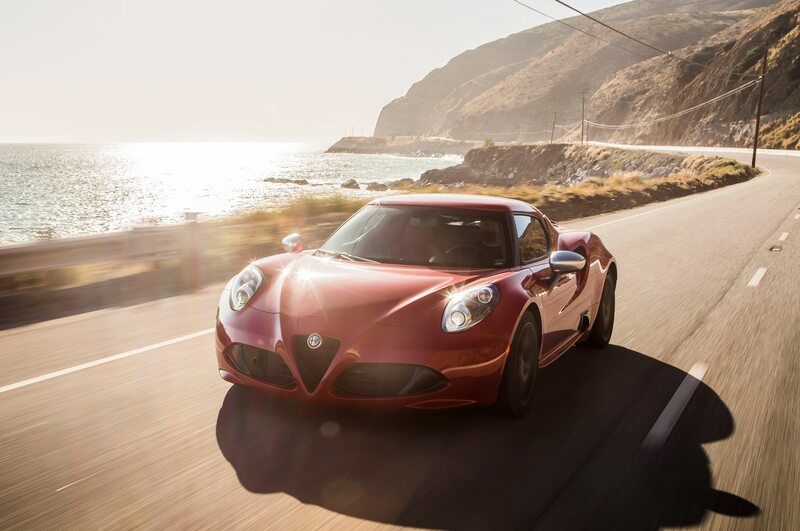 One of the least seen, too; Alfa said it would produce only 1,000 units of the 4C annually for the States, so chances were we wouldn’t confuse our 4C with someone else’s. 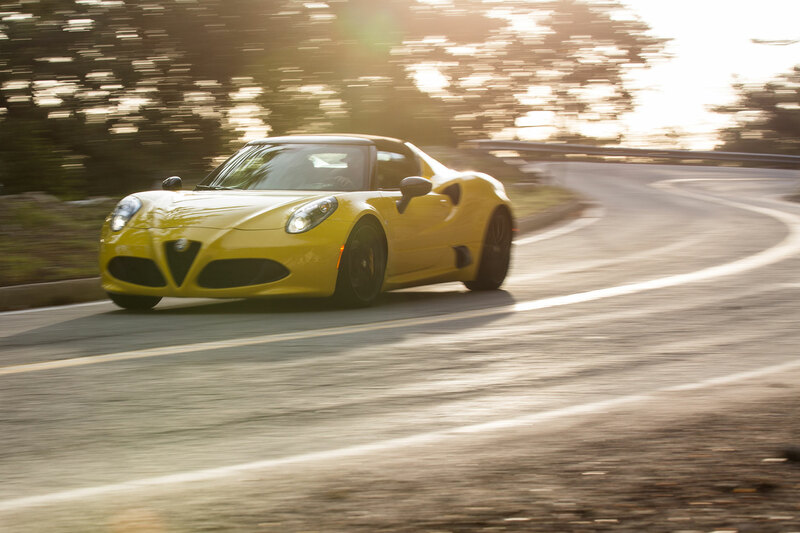 When the 4C showed up at our Detroit office on a chilly spring morning, yours truly made an on-the-spot call that the Alfa couldn’t live more than a week in Michigan, worried that the horribly pockmarked roads would beat it into submission. 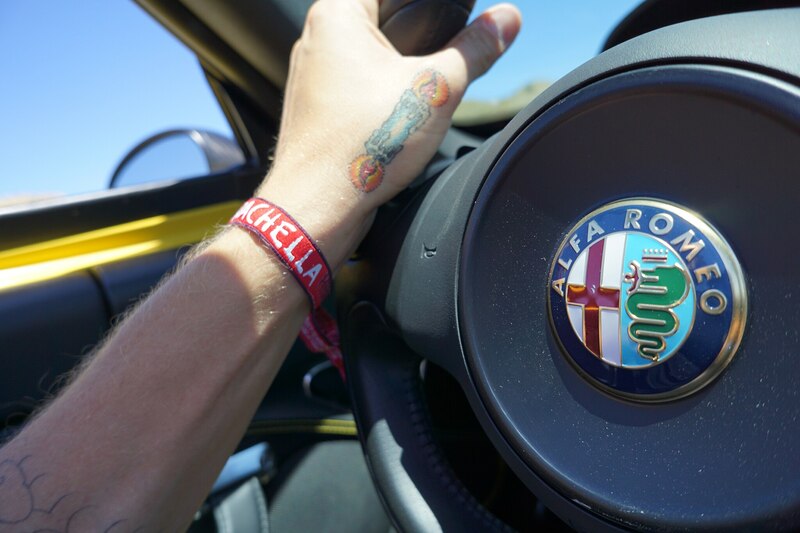 Just after the car arrived at our L.A. office, features editor Rory Jurnecka took off on a 359-mile coastal drive north to beautiful Monterey, home to the annual Pebble Beach Concours d’Elegance. 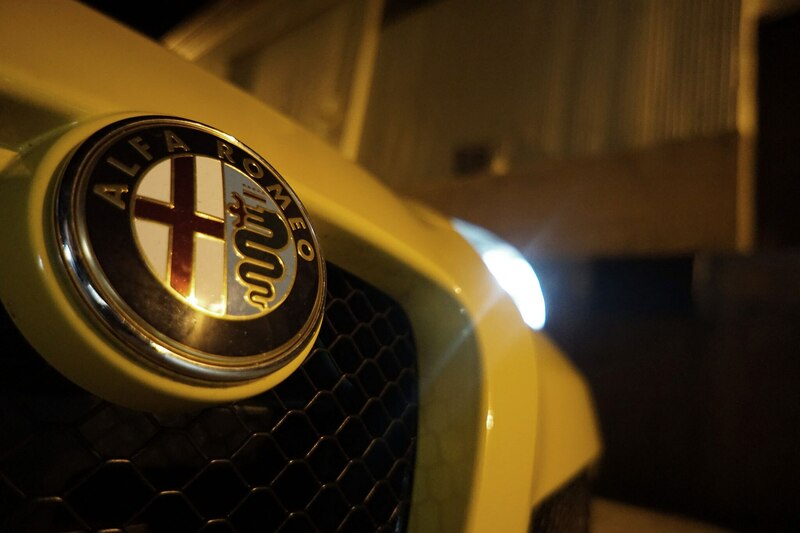 “Cabin noise isn’t awful at a steady 70 mph, but I still wore earplugs for about half the distance.” Jurnecka figured out how to deal with the Alfa’s loudness but couldn’t handle the commotion the car attracted. 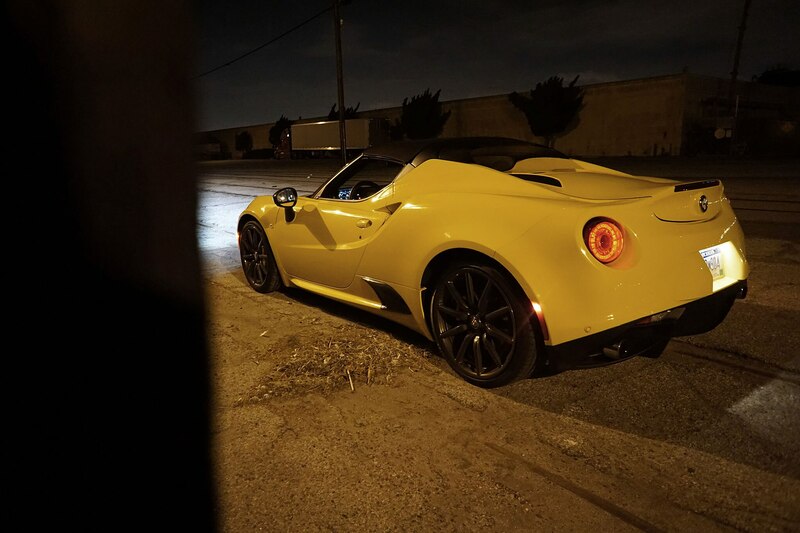 “You don’t quite get Justin Bieber levels of attention, but you get a taste of what it’s like to be, say, David Gilmour.” Other drivers would speed toward the 4C, slow down just behind the car’s rear quarter panels, and camp out in neighboring lanes as they snapped iPhone pictures, which sucked since the 4C’s absolutely enormous rear blind spots would render even full-size SUVs invisible. 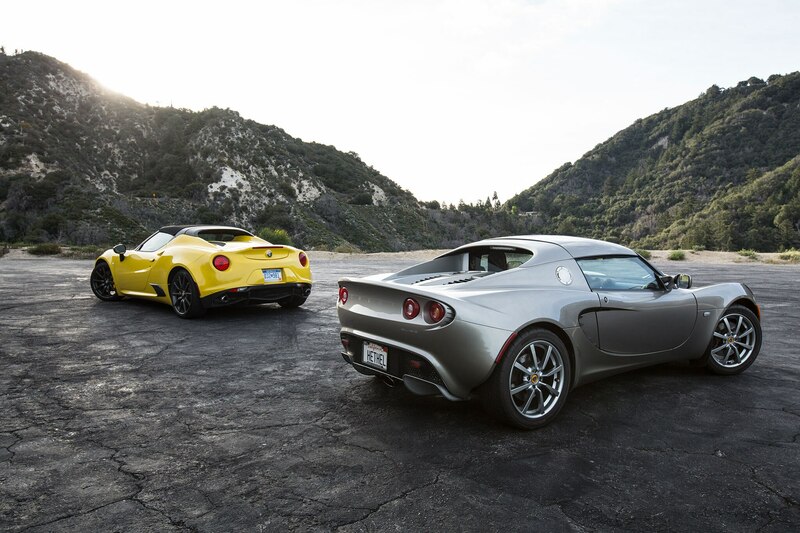 As if we needed another reason to hate L.A. traffic. 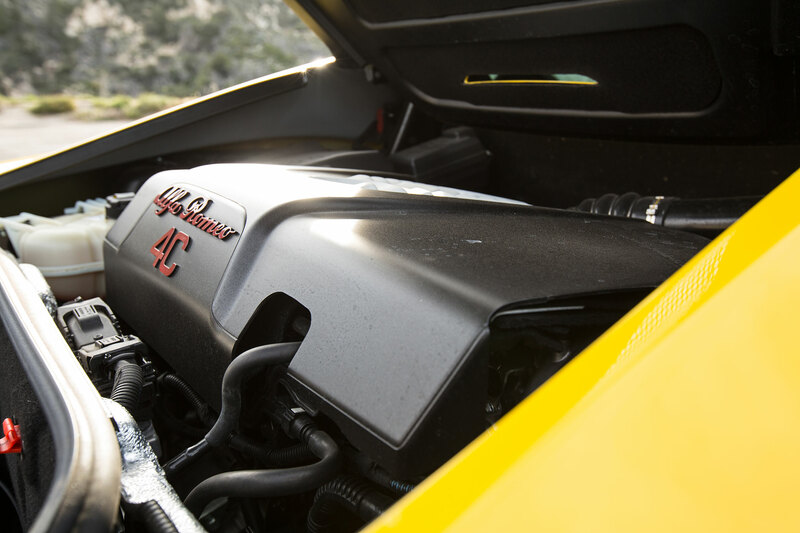 “There’s nothing worse than driving slowly in a mid-engine car,” remarked one editor. 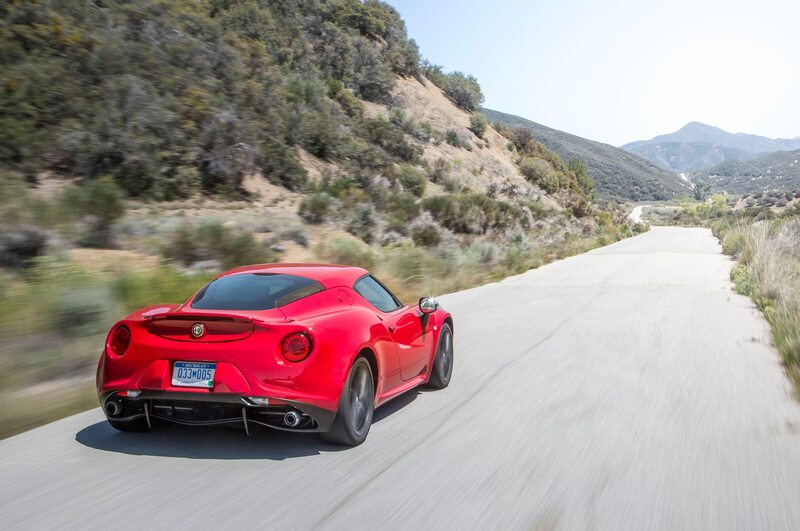 Daily driving in the 4C was an interesting and often exhausting experiment. 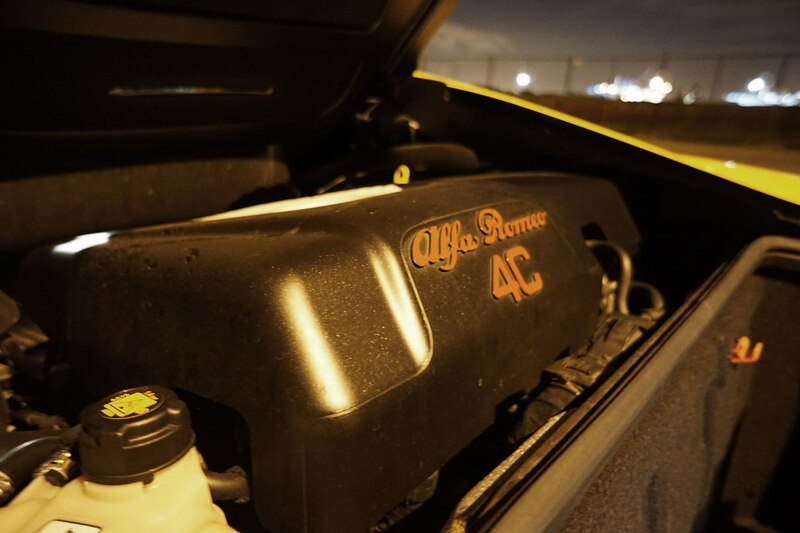 No one could get in or out of the car with any semblance of grace, the lengthy doors often bashed into whatever we parked next to, and we could never see what was behind us because of the big, plastic engine cover that ate up a bunch of space in the already tiny rear window. 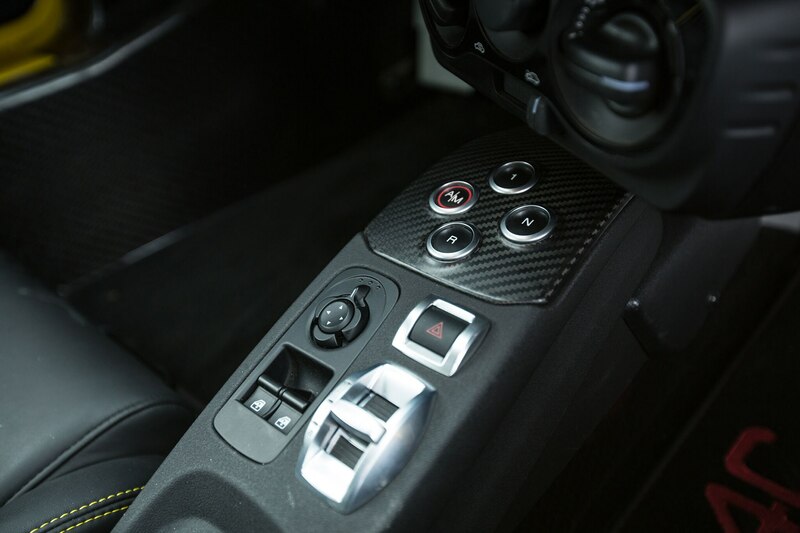 Other issues included having to constantly feather the throttle to get moving, since the six-speed dual-clutch transmission hesitated at low speeds, and unassisted steering meant a lot of unattractive yanking and grunting. 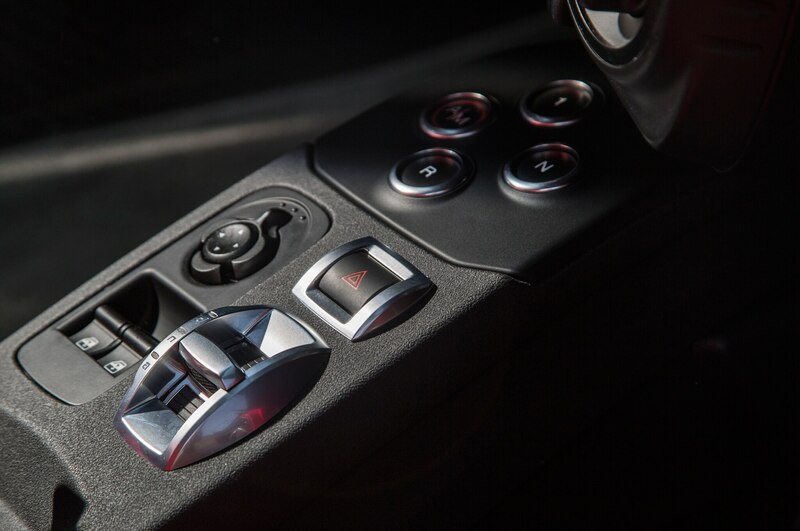 “The steering provides excellent road feel but is annoying in parking lots,” said executive editor Mac Morrison. 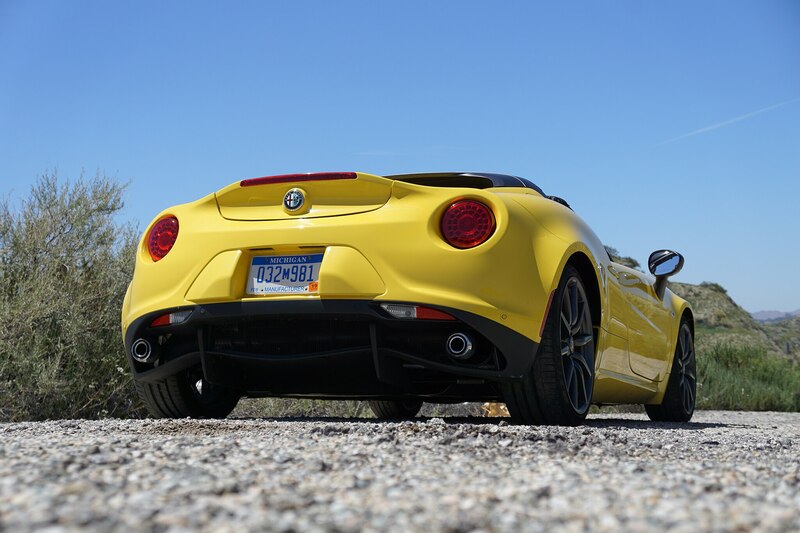 “Then again, since you can store almost nothing in the car, there aren’t a lot of reasons to take it anywhere with a parking lot.” Worst of all was when the 4C bottomed out over small curbs, sometimes so badly that we had to ask our passenger to get out so we could park safely. 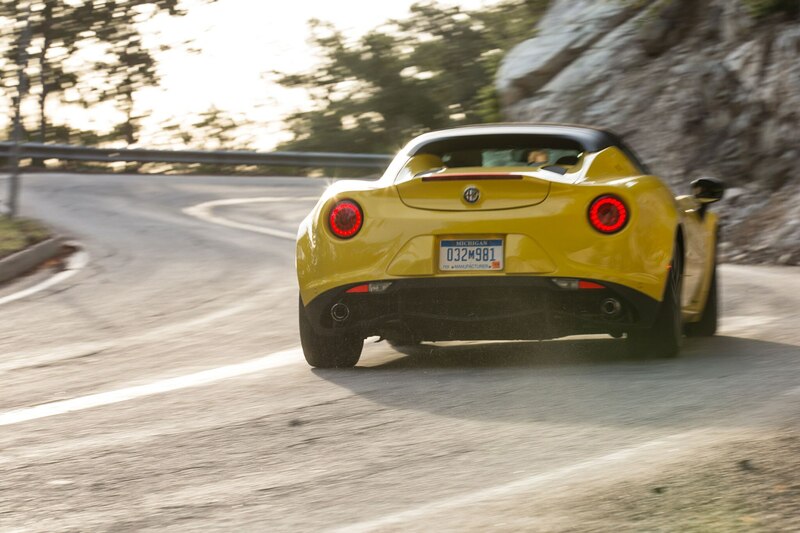 Those all turned into trivial trifles at day’s end, though, when traffic cleared and we steered toward empty two-lanes, where the Alfa once again made all the sense in the world. 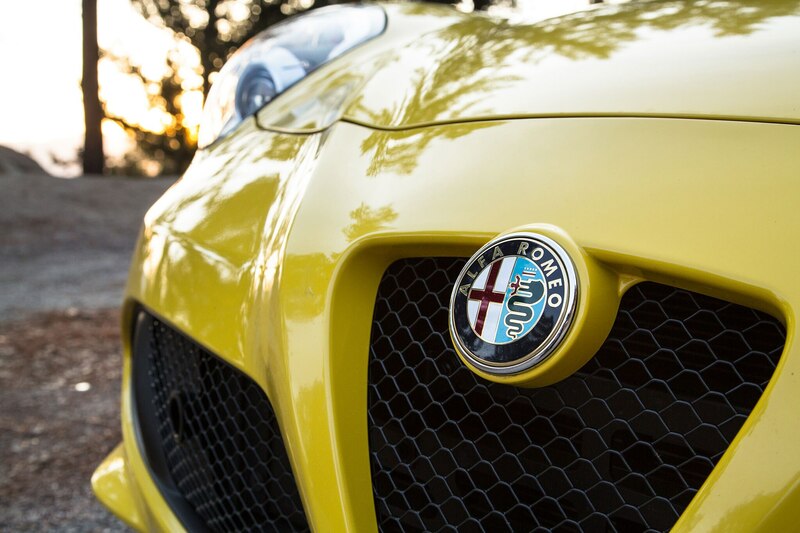 “Nothing else makes you feel so singularly personal,” said contributor Michael Jordan. 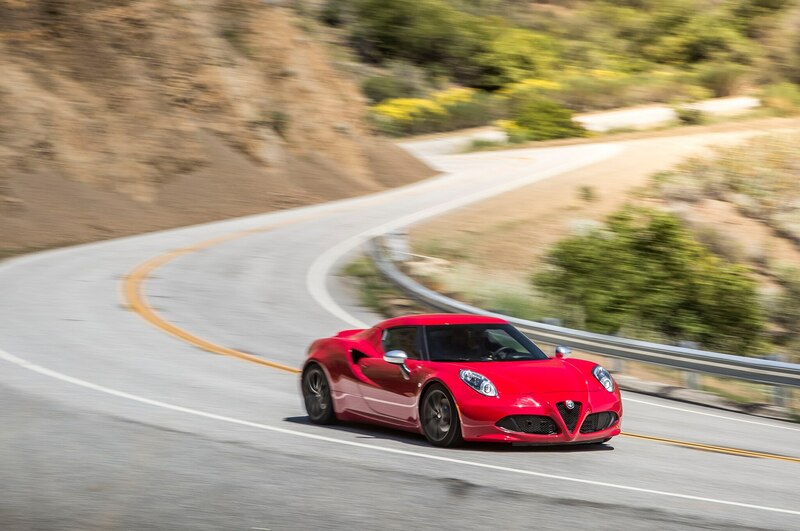 The chassis and suspension communicated every bump and crease in the road, working over the pavement with poise and unshakeable confidence. 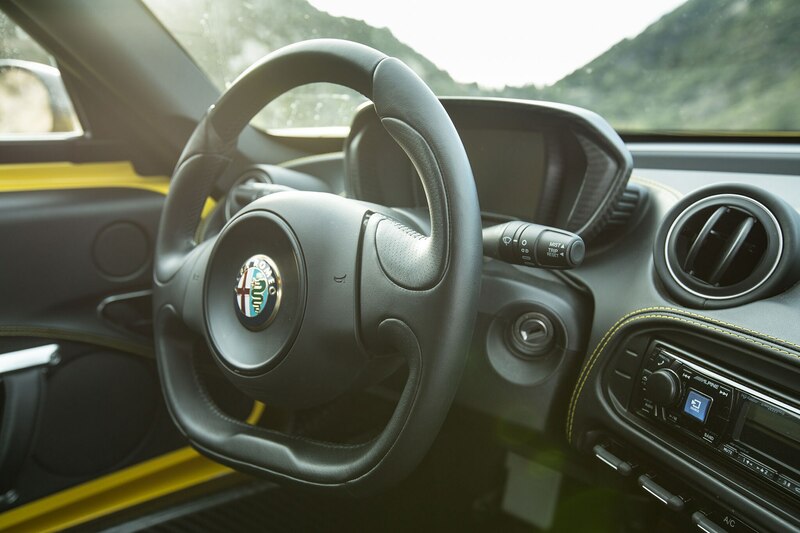 The thick-rimmed steering wheel would shimmy and dance as we tossed the 2,465-pound car from side to side, the large bolsters on the thin-but-comfortable seats holding us tightly. 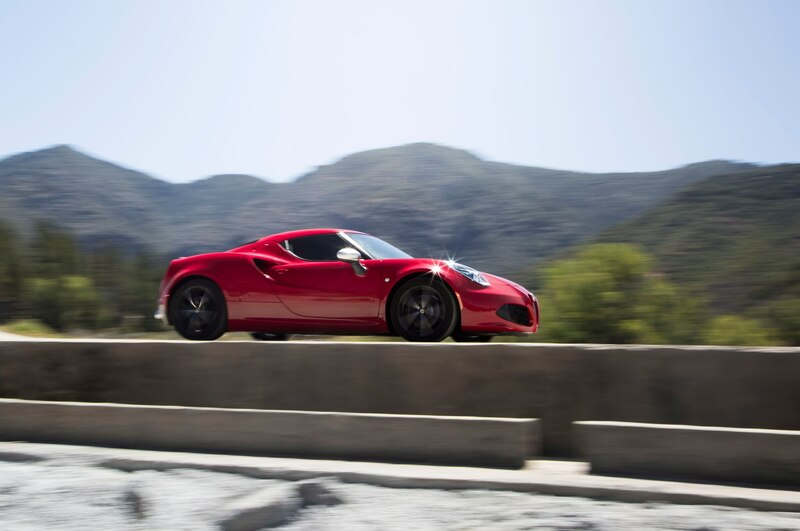 The coupe made it clear where its limits were and, if we drove overzealously, the car wouldn’t snap and be unruly but instead hold steady and let us slowly reel it back in. The Alfa went from 0 to 60 mph in 4 seconds flat and turned a quarter-mile in 12.6 seconds at a trap speed of 108 mph. 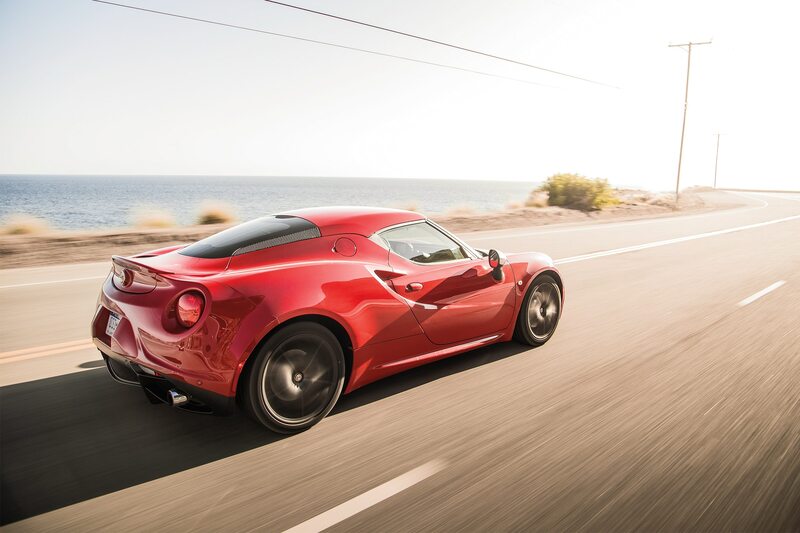 And after slapping on a set of Bridgestone Potenza RE-71R ultra-high-performance tires we ordered from Tire Rack, seeing how we quickly burned through the stock set, the 4C would stop from 60 mph in an astonishingly short 97 feet and could pull up to 1.06 g in a corner. 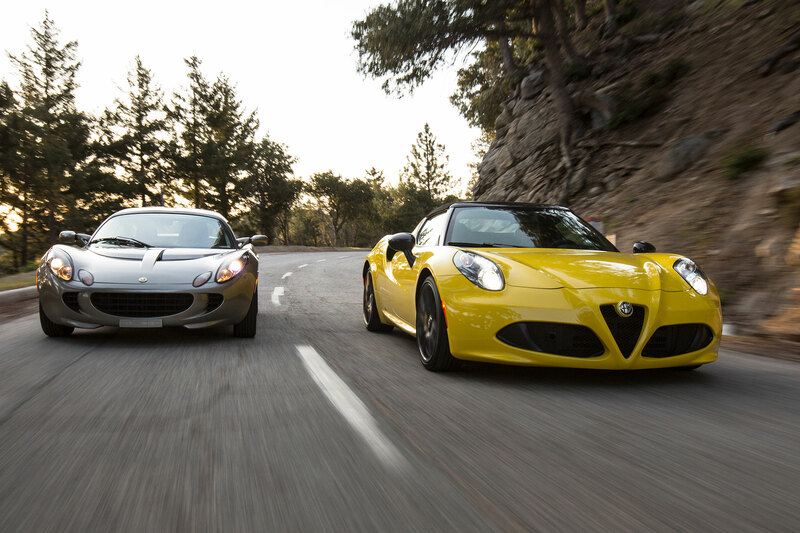 That’s near-supercar performance for the price of a near-luxury sedan. 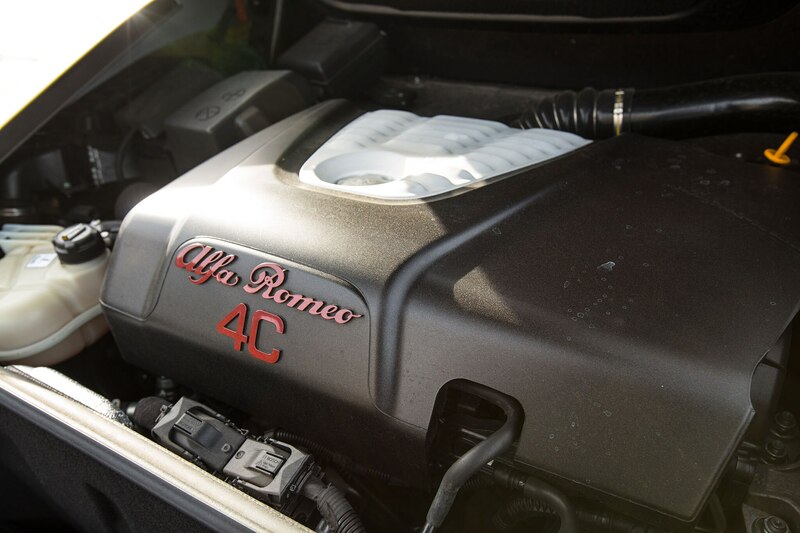 But alas, just as we were getting to know our little red coupe, someone smashed their ’04 Honda Civic into the back of it, maiming the rear suspension and cracking the carbon-fiber body. 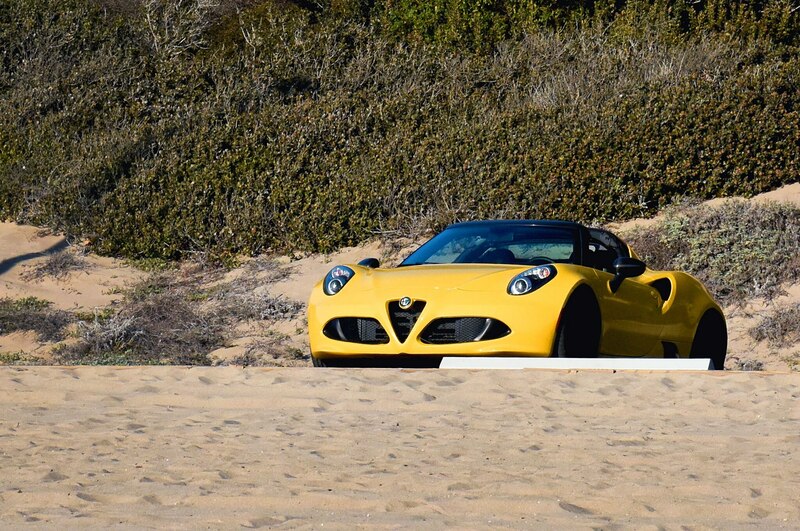 When we told Alfa, the automaker offered us a yellow, open-air 4C Spider so we could finish our test. 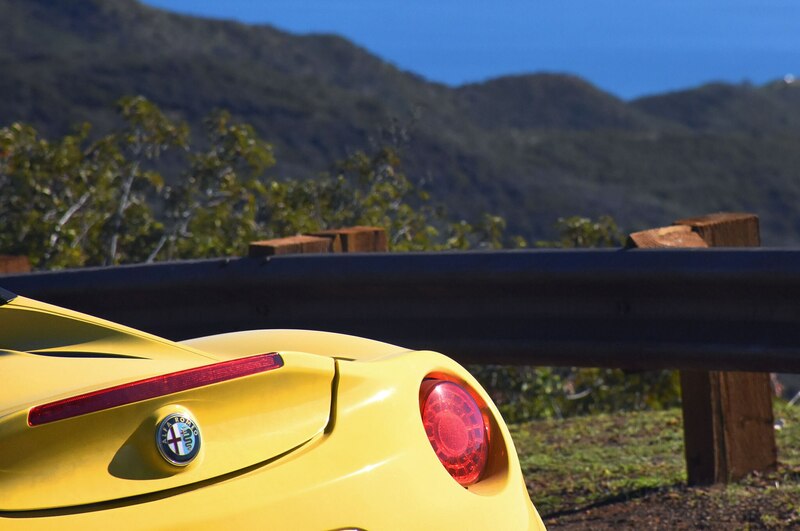 The 4C is unlike any other car on sale in the U.S., prioritizing the driving experience above all else. 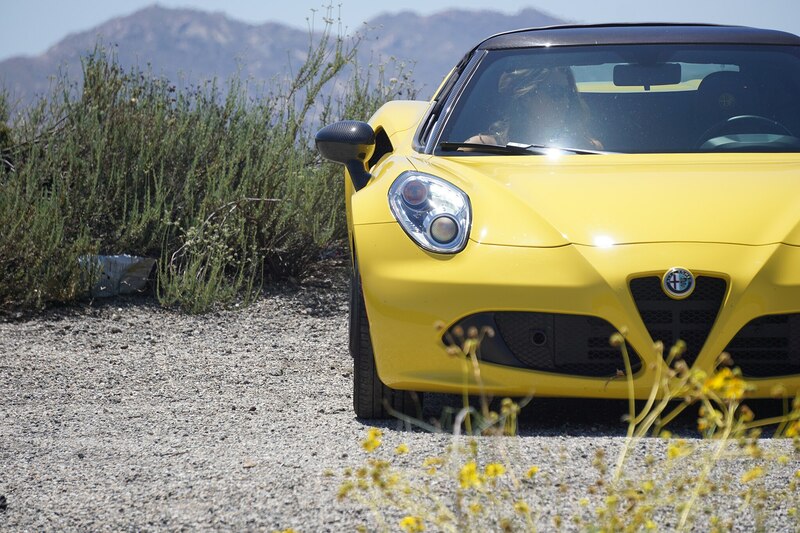 The Spider is 22 pounds heavier than the coupe, its targa-like fabric top takes up precious real estate in the one-roll-aboard-bag trunk, and it carries a $10,300 price premium over the $55,195 coupe. 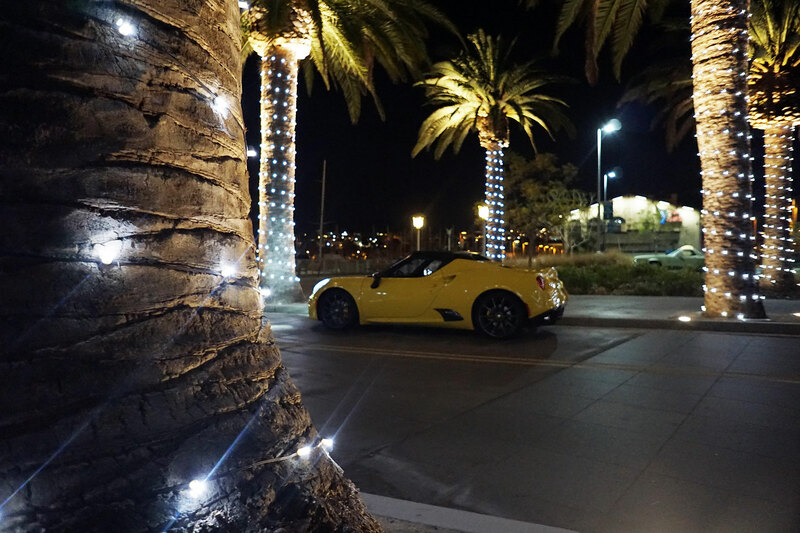 (And that’s before adding $7,900 in options.) 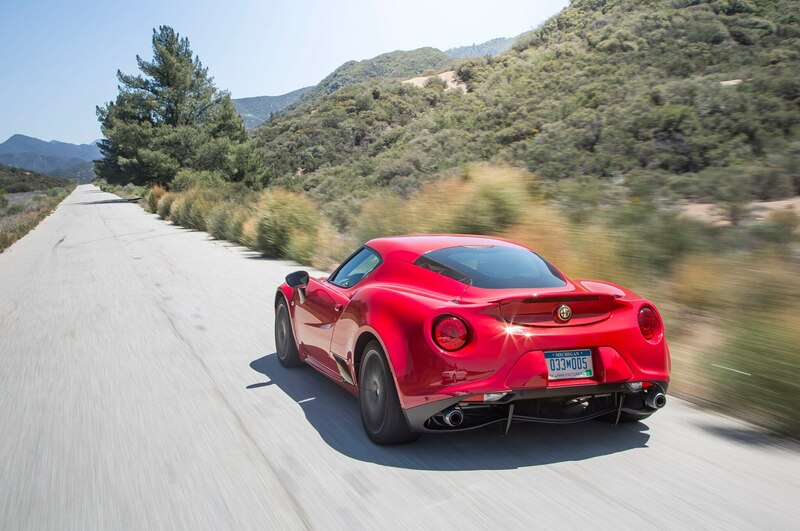 Fortunately, scalping the Alfa didn’t cripple the composite chassis’ rigidity, and we could see more easily through the car’s still-slim rear window thanks to the Spider’s redesigned engine cover. 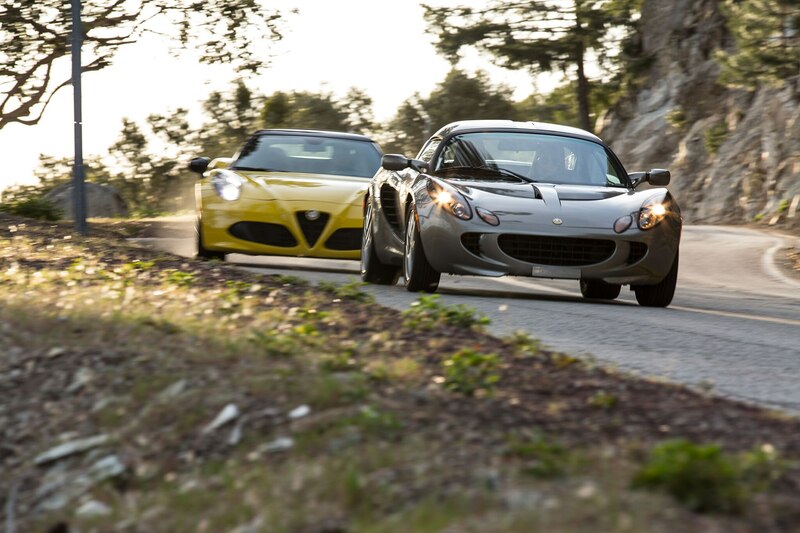 We welcomed the car by immediately running it up to Mazda Raceway Laguna Seca. 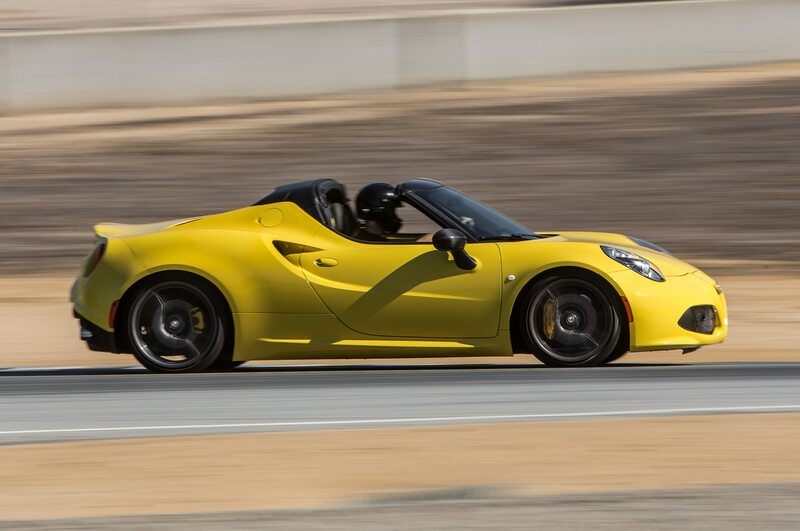 Editor-in-chief Mike Floyd after his first go around Laguna: “This car is a track toy, pure and simple. 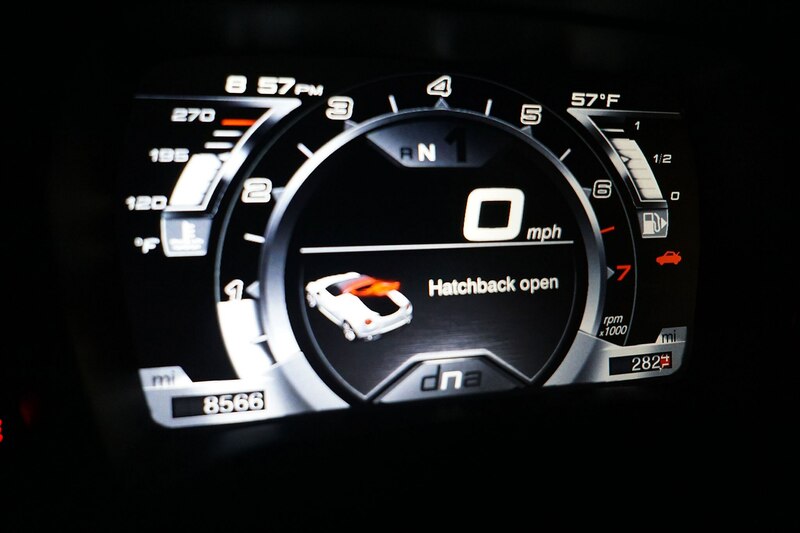 In race mode you’re in full control of the shifts, and the engine will bounce on the rev limiter if you let it. 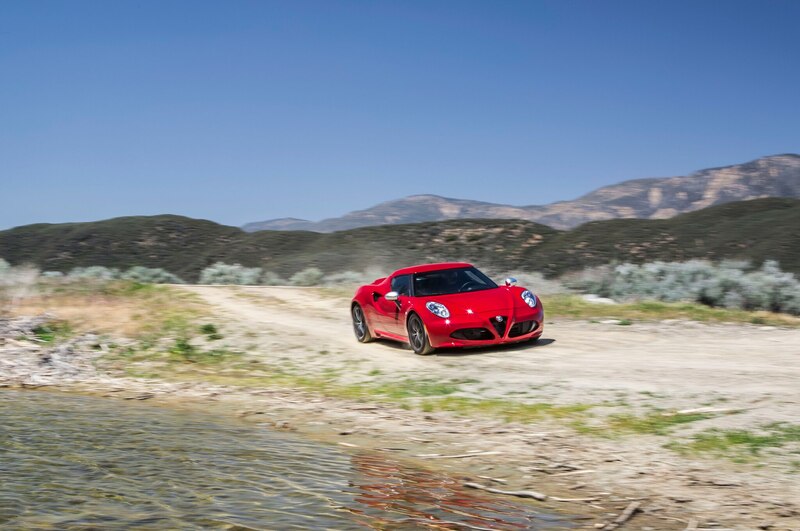 It takes some time to stomp on the rock-hard brake pedal later and later into corners, but once you’re acclimated to the 4C’s character, look out. 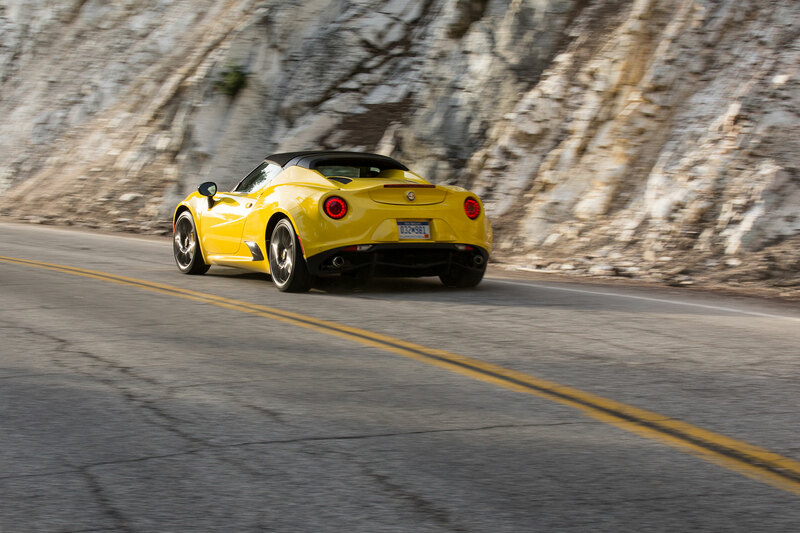 The 4C Spider will let its tail hang out if you tell it to, and there’s just enough power to get you into trouble if you’re not careful. 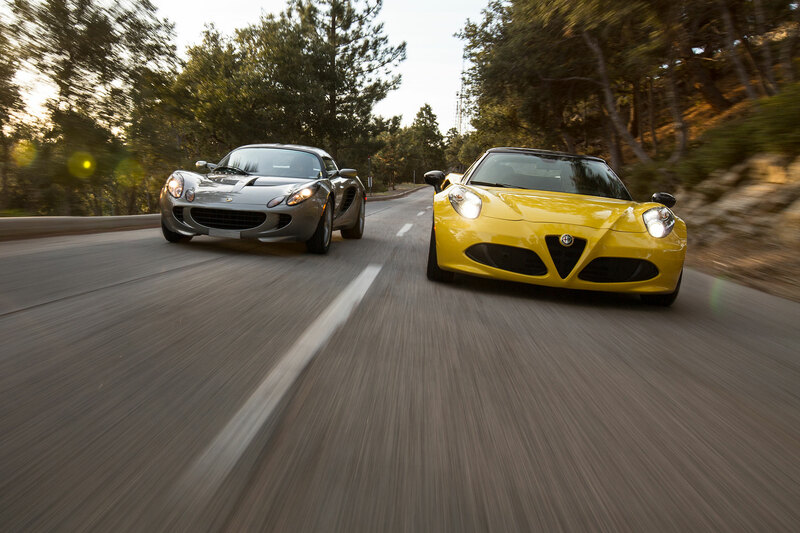 As the laps roll by, you feel more and more in command. 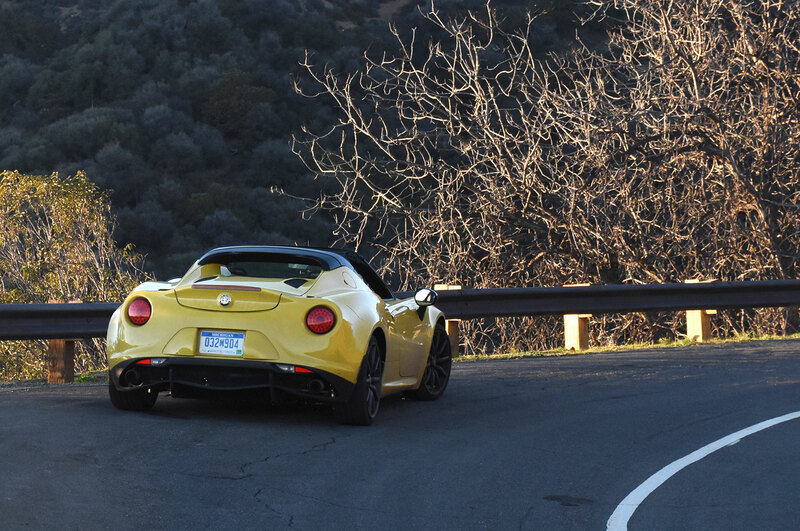 I didn’t want to get out.” Absolutely content on a road course, the Spider also felt more at home on the road than its fixed-roof predecessor. 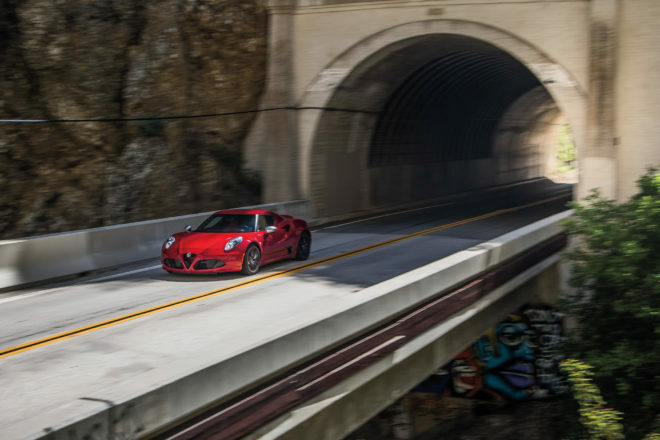 “I’d usually go for the hardtop version of a sports car, but this is an exception,” said Jurnecka, pointing out how the canvas roof helped mute some of the “booming” sounds that would bounce around inside the 4C’s carbon-fiber cabin. 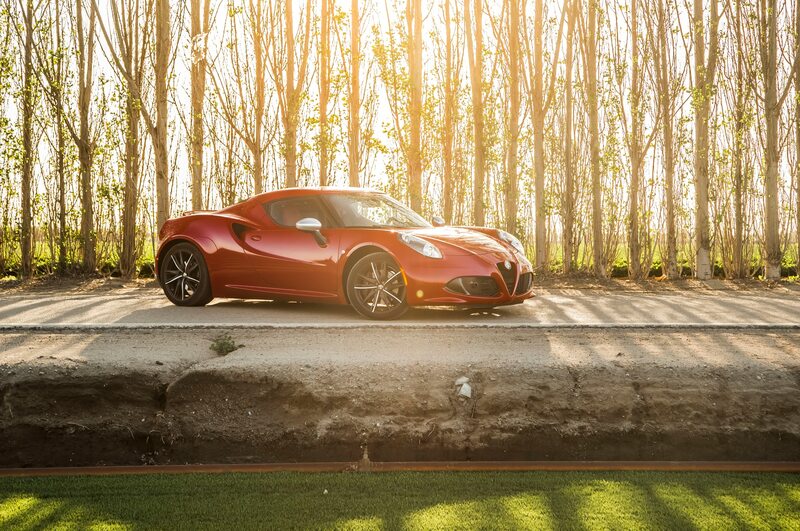 The Spider, like the coupe, had very few maintenance issues, which is not what history would have you expect of an Alfa. 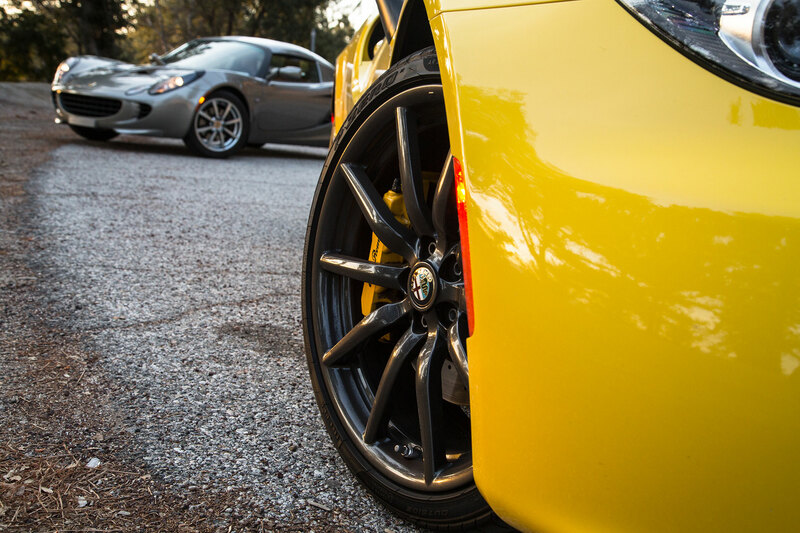 The cars ran consistently and strong, never fumbling to start. 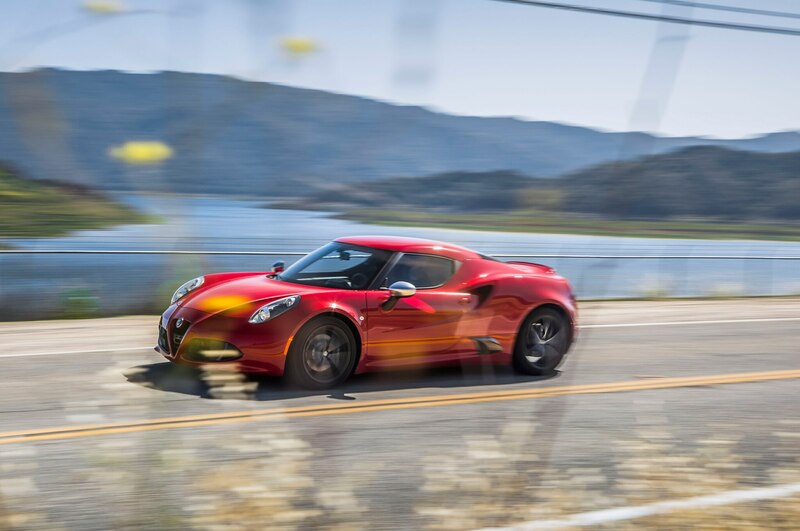 Whether zipping through the twisties of Angeles Crest Highway or around the track at Laguna Seca, the 4C is consistent and strong, giving complete control to the driver. 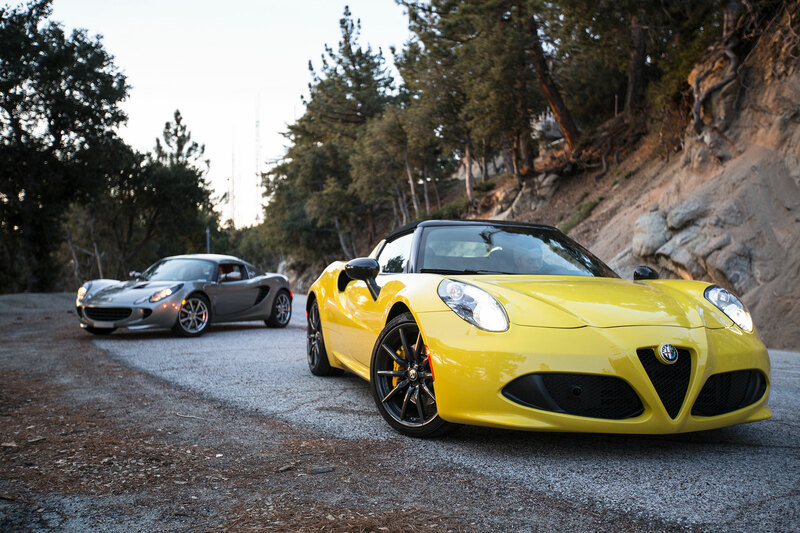 We rounded out our year with the Alfa twins by taking the Spider for high-speed runs up the winding Angeles Crest Highway and slow rolls alongside the Pacific Ocean, certain the car deserved every ounce of praise we initially gave it. 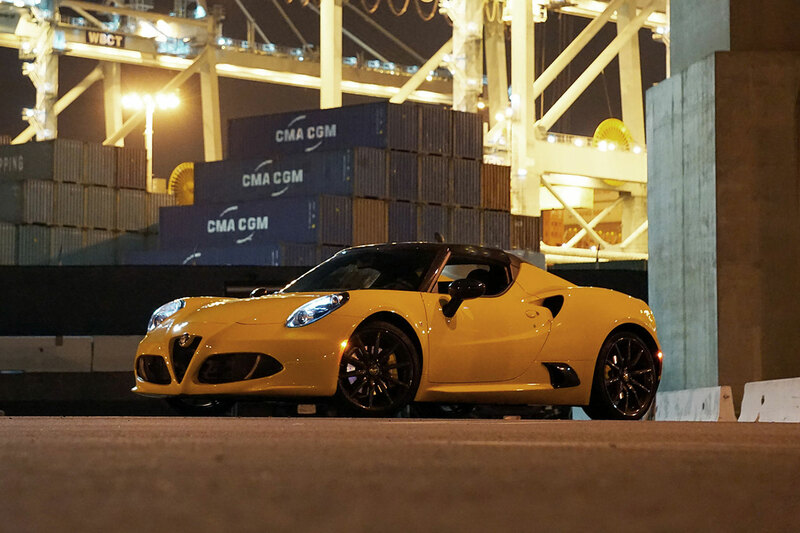 Photos of the 4C will rightfully hang on the walls of Alfistis’ houses, and our time with both the coupe and Spider helped us appreciate the interplay between the car’s strengths and shortcomings. 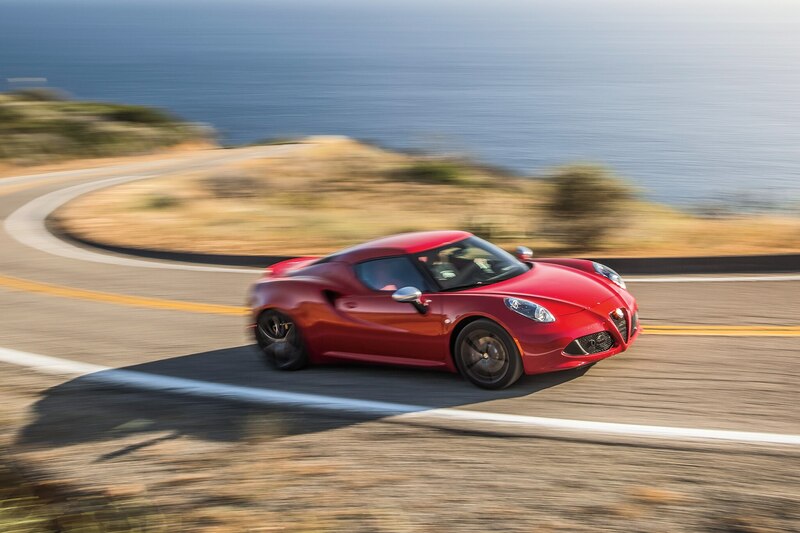 The 4C is unlike any other car on sale in the U.S., prioritizing the driving experience above all else. 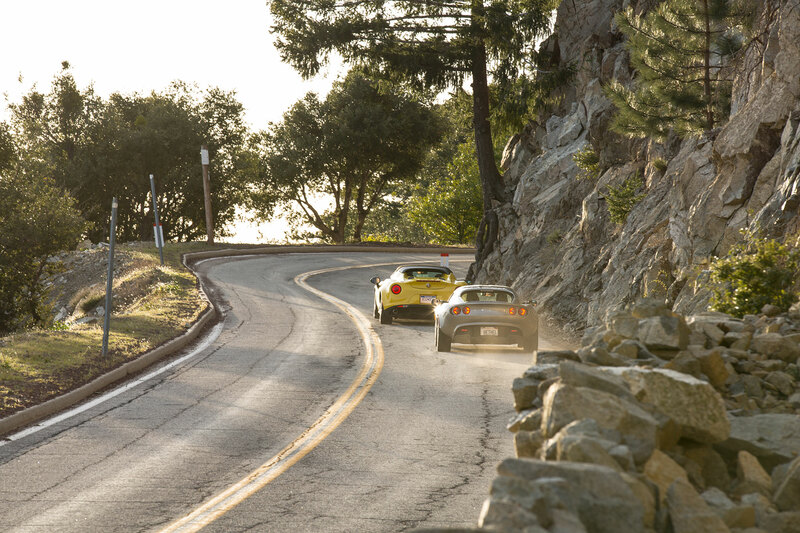 It is unquestionably tailored for track days and tight, twisty roads in backwoods—a specific-use tool, kind of like a chainsaw. 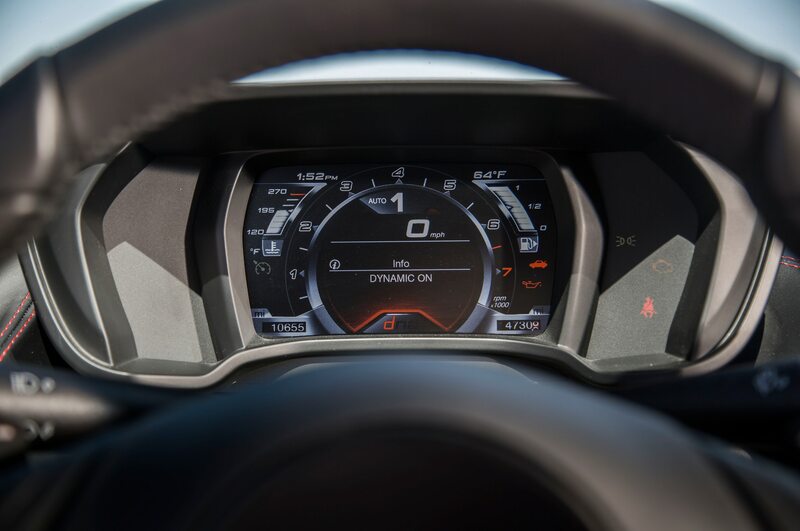 While it can handle mundane and thoughtless tasks, doing so mutates what we see as driver-focused strengths into annoying shortcomings that momentarily turn us off. 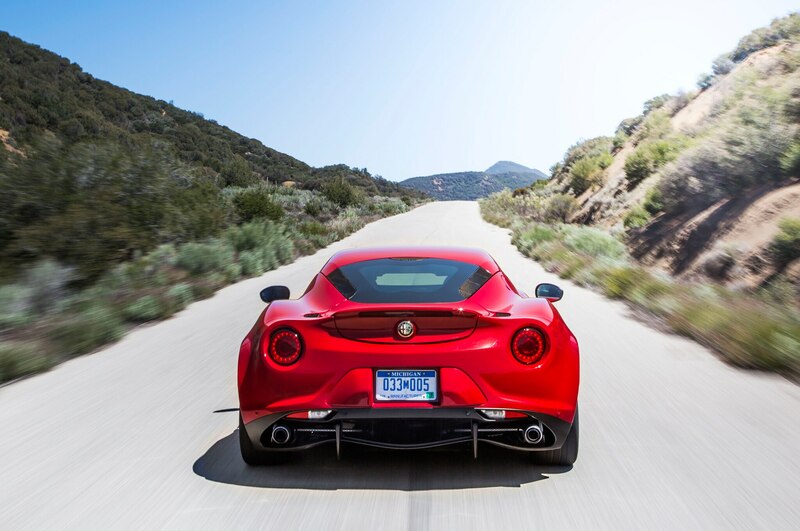 But as we moved away from traffic and crowded parking lots, we were quickly reminded of how and why Alfa’s comeback kid charms us.